This book provides a theoretical-practical framework that links assessment practice to learning theory by synthesizing three theoretical axis of learning: Schema theory - emphasizing the role of prior knowledge in learning; Metacognitive Awareness theory - profiling an expert reader; and the Vygotskian notion of the Zone of Proximal Development - extending and facilitating learners' cognitive abilities and performance by providing a "psychological tool". Increasing learners' metacognitive awareness by applying MetaCognitive Awareness Guidance to reading assessment tasks will not only facilitates students' learning and improve their reading comprehension but will also increase their chances of internalizing the guidance components and applying them in changing learning situations. The research also emphasizes on how teachers' perspectives, thoughts and opinions play a critical role in applying MCAG in teaching. 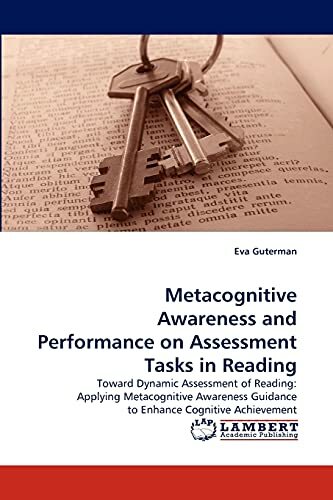 The book focuses on reading assessment that better serve the goals of reliability and validity, and facilitate the kind of assessment that will benefit our students the most, the kind of assessment to which our students are entitled. Eva Guterman (Ph.D): Faculty member in the Department of Education and Psychology at the Open University of Israel and a research staff member in the Evaluation Department. Ph.D. degree at The University of Liverpool, UK, Post-doc research at the U.S. National Institute of Health(NIH), Maryland USA.